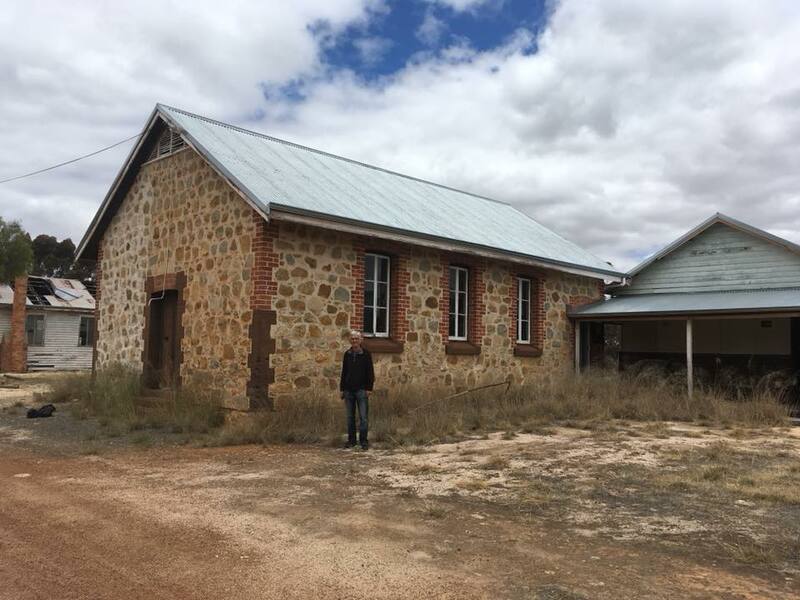 Carrolup School, a healing sanctuary during the time that Noel White was teacher, May 1946 - December 1950. Photographer: John Stanton, 26th November 2018. On Monday, John and I travelled down to Albany to stay with my good friend Tony Davis. We stopped at The Woolshed in Williams, where John ate a tasty savoury muffin and I gorged on a lamb and rosemary pie. John reflected on how he had stopped at the same place with his late-wife Ghislaine and Professor Howard Morphy, the person who discovered the Carrolup ‘lost’ collection, on the way to the ‘Koorah Coolingah’ Exhibition in 2006. We had decided to stop at Carrolup, my third visit in the last two years. As we strolled around the Settlement, John explained to me his experiences during the 6-months he was based on-site (in the old Isolation Unit) during The Carrolup Project in 1987. He will blog about these experiences in the future. We were both deeply saddened to see the physical state of the buildings had deteriorated further from the already poor state we last saw there. As we walked around, we reflected on the history and significance of Carrolup. It was a deeply moving experience for both of us, in particular thinking about the Aboriginal children of Carrolup. We also filmed ourselves with John’s iPhone, intending to put up short film clips on Facebook and the website so that people could see little ‘snippets’ of our trip. Sadly, we have found the speed of the internet here in Albany (even in the Library) to be incredibly slow, so we have been struggling to be able to do this. However, we finally managed to post two clips on John’s Facebook page, one of which – The Fly Revisited – will make you smile. We thought a Spirit has decided to intervene. It’s been a great pleasure staying with Tony Davis. He has been writing a book on the Noongar artist Bella Kelly, along with a history of the interaction between Aboriginal people and Europeans in the South West, so he and I have previously spent many hours discussing Carrolup and other stories. Tony had been looking forward to meeting John for the first time, and I knew they would have lots to talk about. Both men are incredibly passionate and knowledgeable, so I knew I would be in for a good time as well. And I have been enjoying myself. We have had long discussions about Carrolup, trying to piece together various elements of the Story from what each of us know. It’s a wonderful experience sharing aspects of our research, trying to create more clarity about what happened all those years ago. One exciting advance has recently come from information provided by Wayne Tyler, a regular visitor to The Carrolup Story. Tony has always been puzzled by what happened at Carrolup between the time it first closed in 1922 and when it re-opened in 1939. Wayne’s exciting information triggered Tony into conducting further research, and further insights have been gained into what happened during this time. More of that in a future blog. Yesterday, we met up with Annette Davis, a curator who has presented a number of art exhibitions featuring Noongar artists, including the Ripples in the Pond Exhibition and the Bella Kelly Retrospective. I have met Annette several times and have always enjoyed my time with her. John has known her for many years, indeed. We headed out to see two pieces of Carrolup art, the great significance of which is that they are the earliest drawings done by the child artists that can be identified in terms of the date (16th June 1948) and place (Albany) where they were completed. You can read about the demonstration by three Carrolup boys – Parnell Dempster, Reynold Hart and Barry Loo – at the Convention of Departmental Teachers as described in a local newspaper. It was the first time that John had seen these drawings and his delight was clearly evident. In the afternoon, Tony took us to see a good friend of his, The Collector, who showed us some of his Aboriginal art collection, which included a number of pieces by Bella Kelly. I found this to be an enthralling experience personally, not just seeing such beautiful art, but also hearing John discussing various aspects related to the work with The Collector. It was obvious to see how excited The Collector was to have someone as knowledgeable as John discussing the artworks with him. Of course, Annette and Tony joined in the discussions, whilst I sat there quietly viewing the art and listening to the discussions. I would never have dreamt of being in such a position all those years ago when I was working as a neuroscientist studying the brain in universities in Europe and the US. Oh, how lucky I am to be on this particular journey! Tony prepared another delightful meal for us that evening, and we settled down to more discussions. After finishing this blog, I will start reading more from Tony’s book for him and then John and I will head into town. We return to Perth tomorrow.